Dan Marino. Full-contact or not, the NFL champ shows up ready to play. patrick jones talks to the quarterback about keeping your eye on the ball—even if it’s small and white. Western pennsylvania may have given us the greatest golfer ever, but the region is better known for producing football players—more specifically, quarterbacks. With a roster of Hall of Fame QBs including Johnny Unitas (Pittsburgh), Joe Namath (Beaver Falls), Joe Montana (Monongahela) and Jim Kelly (East Brady), it’s no wonder that a young Dan Marino spent his childhood throwing a football with his father and friends around the backyard and in his hometown streets of Pittsburgh. Times change, and today the former Miami Dolphins QB is as likely to be found on the fairway as anywhere else. The nine-time Pro Bowl quarterback was inducted into the National Football League’s (NFL) Hall of Fame in 2005 after an impeccable record-setting career. But long before Marino was wowing the crowds and choosing a set of clubs down south, the blue collar athletic prodigy was slogging it out on wintry fields in the Oakland section of Pittsburgh. For the young future star Latrobe’s Arnold Palmer may have been an idol, but Terry Bradshaw and the Pittsburgh Steelers were more familiar. Marino earned Parade All-American honors as a quarterback at Central Catholic High School. He also starred as a baseball pitcher with a 95 mph fastball and was drafted by the Kansas City Royals. Thankfully (for football fans), Marino chose to stay at home and play quarterback for the University of Pittsburgh. In the 1982 Sugar Bowl, he showed a flash of things to come by leading the Panthers to a dramatic, last-minute win over the Georgia Bulldogs. Not surprisingly, Marino was selected in the first round of the 1983 NFL draft by the Miami Dolphins—a huge career step that also led to the QB’s introduction to golf. “In my first season with the Dolphins in 1983, I started going along with some of the guys on the team that really liked to play,” Marino says, mentioning fellow Dolphins quarterback Don Strock and wide receiver Nat Moore. Marino says that between joining the Palmer and Ed Seay-designed Adios Golf Club and golfing in the off-season, he earned a single-digit handicap in just one year. “I would say that hockey players, baseball players, quarterbacks and certain other football positions have that natural hand-eye coordination that transfers over to learning golf,” says Marino. When he wasn’t busy lowering his handicap, Dan “The Man” Marino, as fans called him, was using his rookie year to make a huge impact on the NFL. He replaced David Woodley as the Dolphins starting quarterback in the sixth game and was stellar enough to be selected as the starting quarterback in the Pro Bowl that same year. As for what came next… Football fans discuss Dan Marino’s second year in the NFL with nearly the same reverential tones golfers reserve for talk of Bobby Jones’ 1930 Grand Slam. And no wonder. In 1984, Marino shattered six NFL passing records, including most passing yards and most touchdown passes in a season. He led Miami to a 14-2 record and a Super Bowl match-up against Joe Montana and the San Francisco 49ers. Though the Dolphins lost the Super Bowl, Marino was named the league’s Most Valuable Player and deservedly won a host of other accolades. 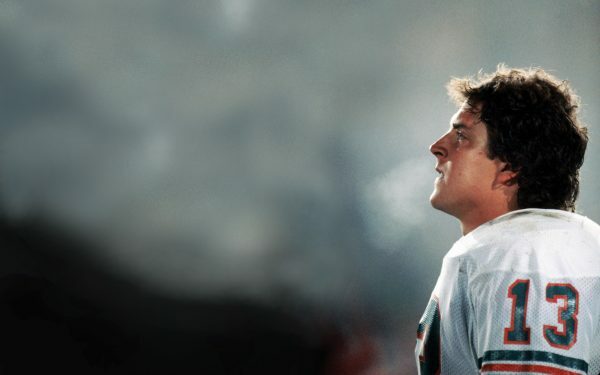 Chronic knee problems hastened Marino’s retirement prior to the 2000 season, at age 38, ending three decades of life in one of sport’s most heated and violent arenas. Golf, with its more placid and pastoral traditions, has helped fill the void. Marino now sports the 3-handicap of an accomplished golfer. He annually hosts his own charity golf tournament, which has raised millions for his Dan Marino Foundation (see sidebar). One of his three sons, Joey, is a freshman on the golf team at the University of North Florida in Jacksonville. And somewhere among his numerous responsibilities, Marino has managed to grab a few rounds with Tiger, Nicklaus and, of course, The King himself. Professional golfers do not go about their business trying to sink game-winning putts while trying to avoid bodily harm. Marino’s job as quarterback required him to throw touchdown passes while sidestepping behemoth linemen, drooling linebackers and heat-seeking, blitzing safeties intent on knocking him on his can. For those reasons, Marino sees little similarities between his favorite two sports from a physical standpoint. “Football is such a physical sport,” he says. “It is a reaction sport. Golf requires you to think about a shot and requires a lot of repetition in the swing. In football, my throwing motion changed at any given time and from play to play. You have to react to a situation like a blitz and try to make a completion anyway that you can, where in golf you don’t want your swing motions to change much at all. Marino does, though, see a few psychological correlations between football and golf. “The one thing in football that you have to learn as a quarterback—and golf helps you with this—is to stay focused and in the moment,” he says. “You have to be thick-skinned as a quarterback. If something bad happens, like an interception or a fumble, you have to let it go away and look for to the next opportunity. Marino says that he averages about a round of golf per week. Most rounds are played at his home course at Adios, though he also gets in regular rounds at The Floridian and on McArthur Golf Course in Hobe Sound. “I really enjoy the competition that golf offers,” says Marino, who still maintains a high profile in the public eye. He is an analyst on “The NFL Today” on CBS and his handsome visage makes him the perfect pitchman for a number of consumer products, including the NutriSystem weight loss system (“I lost 22 pounds and so can you!”). “There are not a lot of other things in life that I can compete in that are similar to what I experienced playing football,” says Marino. “Golf is one of them. You are out there playing against the course… That gets the competitive side of me going again, and I enjoy that part of it. When critiquing his game, Marino says his short game suffers because he doesn’t get many chances to work on it. His golf highlights include a round of 65 at Weston Hills Country Club, a hole-in-one at Grande Oak Golf Club in Fort Lauderdale and a double eagle on the par-5, 485-yard No. 2 at Doral Silver Golf Course. Former Miami Dolphins quarterback Dan Marino annually hosts the Dan Marino Celebrity Invitational Golf Tournament in South Florida. It attracts corporate sponsorships and brings in some of his sporting buddies including Jim Kelly, John Elway and hockey great Mario Lemieux, to name a few. The event is just one fund-raiser for the Dan Marino Foundation, established in 1992 by Dan and his wife, Claire, to help thousands of children with chronic illnesses and developmental disabilities. Michael, the second of the Marinos’ six children, was diagnosed with autism and inspired the foundation’s creation. It has since raised more than $22 million to support medical research, treatment, and outreach programs. Marino’s philanthropic achievements have rivaled those that he posted on the playing field. Visit danmarinofoundation.org to learn how you can help.